Developing Performance Indicators for Managing Maintenance is designed to provide the key details on how to measure and improve one of the most important functions in an organization today: Equipment or Asset Maintenance Management. 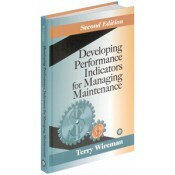 As one of only a handful of comprehensive collections of performance indicators for managing maintenance in print today, this book is distinguished by its use of techniques based on a variety of management measurement systems, such as the Balanced Scorecard approach. While the previous edition primarily concentrated on the basic indicators for managing maintenance and how to link them to a company’s financials, this new edition goes further by also addressing recent advancements in the management of maintenance. This book is an invaluable tool for any company that wants to effectively measure and manage the entire spectrum of maintenance activities to help achieve competitive advantage. Such companies view maintenance as a way to reduce costs of producing their product or providing their services and are intent on using this cost advantage to lower prices, improve profit margins, and improve shareholder value. • Shows how to maximize your investment in the maintenance function and ultimately your company's assets by helping you focus on specific indicators. • Connects typical functional maintenance indicators to a company's strategic indicators. • Explains how to improve low-performing indicators.